The following article was taken from an excellent booklet entitled 'Malvern Freemasonry and the Masonic Hall', first published in August 2005 by W.Bro. R. F. Hall-Jones, a member of the Malvern Hills Lodge No. 6896. The article explains the development of Freemasonry in Malvern and gives an account of the origins and uses of the buildings now known as the Masonic Hall. The Masonic Hall, situated on Belle Vue Terrace in Great Malvern, has been the home of the Malvern Freemasons since 1911. The origins of Great Malvern lie in the foundation of a Priory of Benedictine Monks in 1085. After the Priory was dissolved in 1539, the village that had grown next to it hardly changed until Dr. Wall of Worcester made public the extreme purity and healing effects of Malvern Water in the middle of the eighteenth century. Malvern became a popular 'watering place' or spa and many of the elegant late Georgian and Regency properties were built in the late eighteenth and early nineteenth centuries. Malvern also benefited from being on the high road between Worcester and Ledbury, so that accommodating travellers remained a priority in addition to accommodating the growing number of visitors. The Crown Inn on Belle Vue Terrace was in existence from at least the mid-eighteenth century. Lloyds Bank now stands in its place. 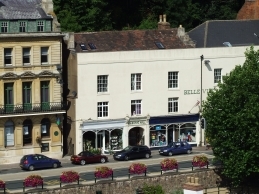 The Belle Vue Hotel was built next to the Crown Inn at about 1816 and most of that hotel remains today, although its ground floor rooms have been converted into shops. An engraved advertisement from Lewis's Directory of Worcestershire of 1820 shows the elegant three storey building with four entrances. The main entrance to the hotel, which is now the entrance to the Masonic Hall, has a columned porch and at the north end is a wide carriage entrance with doors. The advertisement proclaimed, 'Families boarded in private apartments, good post horses with closed and open carriages, excellent stables for horses and livery with commodious coach houses'. It was part of this building that was to become the Masonic Hall. In 1812 there was a dramatic change in Malvern's prosperity after two doctors, James Gully and James Wilson, chose Malvern in which to establish the new 'Cold Water Cure'. They took a lease of the Crown Hotel and within a few years had expanded into their own newly built establishments and were attracting patients, more hydropathic doctors and other visitors in great numbers. New boarding houses, water cure establishments and residences were built and so quickly had Malvern developed that by 1851 it had an Act of Parliament to establish a 'Local Board', the forerunner of the Malvern Urban District Council. A local solicitor, Thomas Barneby, was the first clerk of this Board and his first office was a the Belle Vue Hotel. By 1860 the population was over 3,500 and the railway had arrived, linking Malvern to Worcester and, a year later, to Hereford. It is recorded that in November 1801 James Stokes, gentleman, of Malvern, was initiated in the Worcester Lodge which had been founded in 1790 and then met at the Rein Deer Inn in Mealcheapen Street, Worcester. He may have been the first Malvern Freemason. In the middle part of the nineteenth century, before the founding of The Royds Lodge, there were many residents of the expanding and thriving town of Malvern who were members of Worcester Lodges. Edward Wallace Elmslie, who settled in Malvern in 1855, is of special interest. He was initiated into the Worcester Lodge No. 280 in 1857 and was the notable architect of Great Malvern Station, the Imperial Hotel (now Malvern St James), the Priory Park Mansion (now the Council House) and many other buildings in the town. In 1846 another Lodge was founded in Worcester, Lodge Semper Fidelis No. 529. A group of members of this Lodge met in 1867 and decided to found a Lodge in Malvern. It was named The Royds Lodge after the Provincial Grand Master for Worcestershire at the time, Albert Hudson Royds. It was consecrated at Townshend House, the establishment of one of the water cure doctors, Ralph Barnes Grindrod, in December 1867. That building later became a monastery and is now the Music School of Malvern College at the corner of Priory and College Roads. The consecration meeting was followed by a service in Great Malvern Priory and a banquet at the Belle Vue Hotel. Meetings of The Royds Lodge were held at the Belle Vue Hotel for several years, but changed in 1876 to the Imperial Hotel. In 1879, the Lodge took a lease and moved to what had been the bath house of Hardwicke House, formerly the water cure establishment of Dr. Marsden, for by this time the founders of the Water Cure had died or retired and the Water Cure itself was in serious decline. Hardwicke House, in Abbey Road, was replaced by an ugly block of flats in the 1950s, but the bath house, still called 'Royds Lodge', though altered, still exists as a private residence in College Road. The premises in College Road had problems, so that by the 1900s The Royds Lodge was looking for alternative accommodation. This was eventually found at the Belle Vue Hotel. This hotel was said to have been celebrated as a coaching house with 'as many as twenty-five to thirty coaches passing in and out daily'. However, with the coming of the railway to Great Malvern in 1861, 'an immediate diminution of this particular trade resulted'. That might suggest that in the early 1860s the stables and coach houses behind the main frontage were replaced with two storey buildings that were to contain the Masonic Hall. It seems that the hotel had suffered gradual decline, although there is evidence of refurbishment in 1906 and active marketing by the publication of its own version of a local guide book. The new buildings constructed behind the main frontage were approached by an open passage which ran the length of the building. In 1906, it was stated that the billiard room 'had been roofed in, and nicely set out with shrubs and flowering plants and window boxes, presents quite a gay appearance; now designated the 'Alleyway', it has shed all its former discomforts of cold, wind and rain'. Part of this 'Alleyway' is crossed at the ground floor level at the end of the passage leading from Belle Vue Terrace into the Masonic Hall. Indeed, a Victorian bay window that fronted this alleyway can be seen on the left of the inner entrance door. Until a few years ago, that entrance passage was of double width with stairs leading off to the flats above. It was altered by building a dividing wall to give security to the building by having two independent entrances set back inside the arched and gated porch entrance from Belle Vue Terrace. In 1911, The Royds Lodge took a lease which included the entrance hall, kitchen, dining room, Masonic Hall, ante-room and, staircases and landings. The main rooms were the dining room and Hall, both at first floor level at the back of the premises which were approached by the passage mentioned above that had formed the entrance hall of the hotel. The Belle Vue Hotel did not close, although it did reduce in size. Several shops were created in the ground floor rooms and the rooms above the entrance became offices. The hotel retained an entrance through what is now the wine bar and seems to have continued in that part of the building for another twenty years. The Masonic Hall, now usually called the 'Lodge Room', was the Billiard Room, which had been advertised in the early 1860s. In 1906 it was reported to have been re-decorated and re-opened. The following is a contemporary description: 'The Billiard Room is of unusually fine, lofty and spacious proportions, easily finding space for the three tables it now contains. The addition of three handsome settees upholstered in red leather, club fenders to the fireplaces and comfortable carpets surrounding each table have nothing but good to say, while the effect of its redecoration has been to lighten the room and rendered its noble proportions more handsome in effect'. The first Lodge meeting was held there on the 9th January, 1912. A picture of the Billiard Room from 1906 shows how little it has changed over almost a century. The ornate doors are a particularly significant feature; the two on the north wall opening into cupboards. The 'three handsome settees' mentioned in 1906 still appear to be in use in the Lodge Room today. However, the fireplaces have been removed, the lighting changed and the skylight and large west-facing window have been boarded over. The dining room is thought to have been the refreshment room allocated to commercial travellers to entertain their local customers. It seems that the dining room also served as the Oak Tea Lounge until at least 1928 and it was obviously a refreshment room open to the public. An advertisement shows that it was in the same ownership as the Oak Tree in Graham Road. It also shows that, apart from the furniture, it has not changed over the years except for the new bar in the alcove. The dining room has been used for non-Masonic events. For instance, in 1933 the Old Lytteltonian Association held its first reunion dinner there. The Association was for old boys of the Lyttelton Grammar School which closed in 1946 and was in the old building now known as the Lyttelton Well in Church Street. The lease of the building was due to expire in 2001, but to secure the future of the Masonic Hall a new 150-year lease was obtained in 1989 which resolved the uncertainty and the financial and legal difficulties that would arise when the old lease came to an end. As previously mentioned, The Royds Lodge met for a few years at the Imperial Hotel, which became the Malvern Girls' College in 1919. In the same year, St Werstan's Lodge was founded as a daughter Lodge to meet in the summer months, particularly for the benefit of fathers of girls at the Girls' College visiting Malvern. This Lodge moved to Evesham in 1976 and still meets there between April and September. In 1934, The Royds Royal Arch Chapter No. 1204 was founded and consecrated, mainly by members of The Royds Lodge. Today, The Royds Royal Arch Chapter is one of the largest Chapters in Worcestershire. After the second world war, there was substantial interest in Freemasonry nationally and such was the demand for membership that many Lodges became oversubscribed and new ones were founded to accommodate the new members. In Malvern, this resulted in the consecration of the Malvern Hills Lodge No. 6896 in 1949, another daughter Lodge of The Royds Lodge. In 1969, brethren from another Masonic order, Mark Masonry, founded the Malvern Priory Lodge of Mark Master Masons No. 1351. More recently, the Morgan Lodge No. 9816, a daughter Lodge of the Malvern Hills Lodge, was consecrated on Saturday 18th March, 2006. This Lodge is intended for owners and supporters of the famous Morgan motor cars, which are still made in Malven. Another Lodge meets once a year in Malvern, but not at the Masonic Hall on Belle Vue Terrace. The Old Malvernian Lodge is a London Lodge and a member of the Public School Lodges' Council. It is essentially for old boys of Malvern College and holds three regular meetings in London, and just one of its meetings every year at Malvern College on the eve of he summer Old Malvernian weekend. Most of the general furnishings at the Masonic Hall belong to The Royds Lodge and are held on permanent loan by the Malvern Masonic Buildings Management Committee, which includes representatives from all the Lodges and the Chapter that meets there. The most striking items of furniture in the room are the three pedestals for the Master, the Senior Warden and the Junior Warden. These were the original items supplied to The Royds Lodge by Messers Cox and Painter of Malvern. That was the business founded in 1833 that was to become Warwick House on the Wells Road. They were designed by Bro. A. Haddon, a well-known local architect whose offices were at Rockliffe in Church Street and who was responsible for the design of many prominent buildings. The Master's Chair was presented in 1872 by W.Bro. T. E. Lucy and Bro. T. Cox. It had belonged to Bro. George Cox of Worcester, who was their uncle. It was believed to have been used by Bishop Latimer, the Bishop of Worcester between 1535 and 1539, and by Oliver Cromwell. There is no written evidence to support this, but it was stated to have been in the possession of the Lucy family or many years, possibly two centuries. Behind the Master's Chair are the four banners belonging to The Royds Royal Arch Chapter. Nearby, on the right, are the framed Warrants of the Lodges and the Chapter. The chairs for the Senior and Junior Wardens were presented by Hedley Morris in 1934, in memory of W.Bro. E. Lloyd Morris, Master of The Royds Lodge in 1914. He had been the owner of the grocery business, Tipping and Morris, in Lyttelton House by the Priory Steps, opposite Belle Vue Terrace. The business, which had opened in the 1840s, eventually closed in the 1960s. On a ledge near the door is the stone, carved with a square and compasses, which was removed from the entrance of The Royds Lodge in College Road. Of special interest are some memorials of Albert Hudson Royds. There is a portrait and a pencil sketch of him and in a glass case can be seen the regalia he wore as Provincial Grand Master for Worcestershire. In the corner there is a stick with which he was said to have beaten off robbers near Rochdale in 1835. Along the left hand wall are photographs of Past Masters of The Royds Lodge. This custom was established in 1879 and continues to date. Also on the south wall is a framed roll of the names of these Past Masters which was presented in 1887. The banners of all the Lodges that meet in the Masonic Hall are also hung on this wall. The Royds Lodge banner was designed from the Lodge Seal, which was approved in 1870 and incorporates features from the ancient seals of the priories of Great and Little Malvern. It was embroidered for the centenary in 1967. The Malvern Hills Lodge banner incorporates a view of Great Malvern from Ivy Scar Rock on North Hill. This dramatic view is now virtually lost in trees, but would have been clear when the Lodge was founded in 1949. On the right hand wall are the rolls of Past Masters of The Royds Royal Arch Chapter, the Malvern Hills Lodge and the Malvern Priory Lodge of Mark Master Masons, all in a distinctive style of gold lettering on black. Visitors to the Masonic Hall at Evesham will see the same style for the roll of St Werstan's Lodge, which moved there in 1976. Throughout the years, there have been many Freemasons in Malvern who have had notable connections with the local community; local businessmen who have influenced the development of the town or who have risen to high Masonic office. Some have already been mentioned, but here are just a few further illustrations. The Rev. George Fisk, Vicar of Malvern between 1856 and 1872, and a Freemason, delivered the oration at the consecration of The Royds Lodge in 1867 and the sermon at the service that followed in Great Malvern Priory. The Rev. Arthur Faber, the first headmaster of Malvern College, was a founder member of The Royds Lodge. Albert Brown, the first Master of The Royds Lodge and Master for three years, was the manager of the Malvern branch of the Worcester Old Bank, which stood on Belle Vue Terrace, situated where the arcade is today. He lived over the bank. His two ritual books can be seen in a glass case in the Lodge Room. F. G. Russel, Master of The Royds Lodge in 1878, was a local jeweller and goldsmith, with a business in Worcester Road. He was a member of the Lodge for 56 years, from 1868 to 1925. Sir Harry Dixey, Master of The Royds Lodge in 1888, was Chairman of the Malvern Urban District Council. Henry Wilson, Master of The Royds Lodge in 1889, was proprietor of the School, Malvern Link, a boys' preparatory school in the former Malvern Link Hotel premises next to Malvern Link station. The school closed at its centenary in 1965 and the buildings were later demolished in 1966. M. T. Stevens was an important figure, being at one time managing director of the Assembly Rooms, later to become the Winter Gardens. He is most remembered as the founder of the Malvern Gazette, which had premises in Church Street opposite the Lyttelton Well. He was the Master of The Royds Lodge for two years, in 1914 and 1915. A. E. Baylis, Master of The Royds Lodge in 1917, was a chemist based originally in Barnards Green, but later just below the traffic lights in Great Malvern. His shop remains and the trading name of A. E. Baylis was only changed a few years ago. Frederick Morgan, Master of The Royds Lodge in 1922, who died in 1978 at the age of 100, had been a member for 66 years. C. R. Davis succeeded his father as Managing Director of Bray's in Worcester Road in 1936. He was Master of The Royds Lodge in 1944 and had been a member for 49 years when he died in 1981. There have been many members holding high office in the Masonic Province of Worcestershire. Within living memory, H. E. Clive, was the Assistant and then Deputy Provincial Grand Master for Worcestershire. He was Master of The Royds Lodge in 1926. Charles H. L. Thompson, an officer of Grand Lodge, followed his father in to the Lodge and into the business of Kendall and Co., the department store on two floors which occupied the corner of Church Street and Graham Road and is now divided into three shops including the Halifax bank. He was Master of The Royds Lodge in 1929 and was the first Master of the Malvern Hills Lodge in 1949. Derek Andrew, DSM, a member of the Malvern Hills Lodge and its Master in 1964, also became an officer of Grand Lodge. He was a Justice of the Peace, a Chartered Accountant and a partner in the firm Kendall Wadley, whose offices used to be in Lyttelton House in Abbey Road, opposite Belle Vue Terrace. The Rev. John Guise, Master of The Royds Lodge in 1965, has been Provincial Grand Chaplain of Worcestershire for several years and is an officer of Grand Lodge. Another chemist, he was manager of Boots in Church Street and then, until his retirement, had his own business in partnership with his wife, Brenda, on the corner of Hampden Road in Malvern Link. He was Chairman of the Malvern Hills District Council in 1977-78. Our previous Provincial Grand Master, Richard Goddard, is an honorary member of The Royds, Malvern Hills and Morgan Lodges. He was a Housemaster at Malvern College.